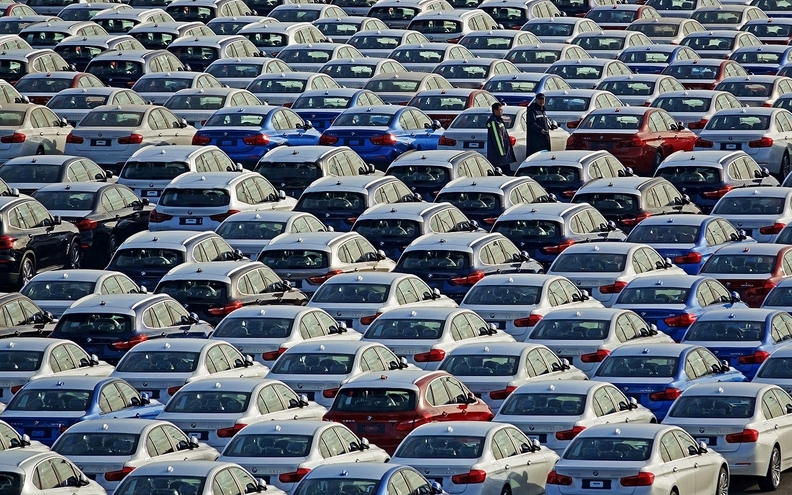 BMW vehicles at the automobile terminal in the port of Dalian, Liaoning province, China on Jan. 9, 2019. FRANKFURT -- German automakers appealed on Monday for tariff-free trade to preserve jobs in Europe and the United States, as the country's auto industry association reported exports of German light vehicles from the United States to China dropped 37 percent last year. A trade conflict between the United States and China is having an adverse impact on the German auto industry, which operates four large light-vehicle factories in the United States and employs 118,000 people there, German auto industry association VDA said. German automakers shipped 95,000 light vehicles, including SUVs and crossovers, made by BMW and Mercedes-Benz from the United States to China last year, down from 150,000 a year earlier, VDA said. German automakers produced 750,000 vehicles at their U.S. plants, of which 56 percent were exported to Europe and China, while around 470,000 vehicles made by German automakers were imported to the United States from Europe, VDA said. "Recent developments once again proved that the automotive industry and the jobs it provides depend heavily on free and fair trade," said Klaus Braeunig, managing director of the German Association of the Automotive Industry, at the North American International Auto Show in Detroit. "This is why we are deeply concerned about the direction that U.S. trade policy has taken since 2017. We should always keep in mind that together the EU and the U.S. account for 50 percent of world trade," Braeunig said in a statement.